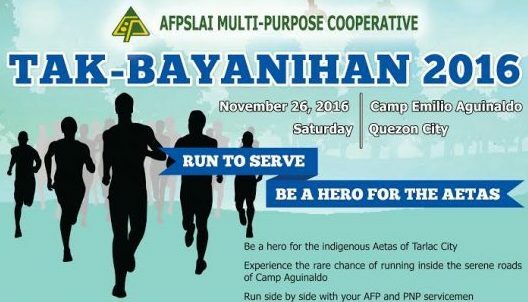 In line with the 30th year anniversary celebration, the AFPSLAI Multi-Purpose Cooperative (AMPC) launches its first ever fun run event dubbed as “TAK-BAYANIHAN 2016: RUN TO SERVE, BE HERO FOR THE AETAS”, the event will be held on November 26, 2016 Saturday at the Camp Emilio Aguinaldo grounds. Part of the income which will be generated from the event will be utilized to support AMPC’s livelihood program for the Aeta community in Tarlac City. As part of the Cooperative’s corporate social responsibility, the AMPC held back-to-back outreach programs last November 28, 2015 and January 23, 2016 benefiting most of the families in Sitio Floras and Sitio Gayaman Aetas in Tarlac City. The Cooperative distributed goods, clothes and cash donations to support the schooling of two Aeta students. The TAK-BAYANIHAN 2016 would be a premier fitness event of the AMPC with the purpose of promoting a healthy and active lifestyle. Likewise, it aims to unleash the hero in every participant by means of helping our less fortunate brothers and sisters. This footrace shall be offered in three varying fitness levels with distances covering 3-KM, 5-KM and 10-KM. All race bibs will have a bar code to allow accurate registration of official race time and automatic posting of results online. This event is open to runners and walkers of all ages and abilities from the AFP and DILG units like the PNP, BFP and BJMP, employees of allied financial institutions like the AFPGIC, AFPMBAI and AFPRSBS, other cooperatives, students and running enthusiasts all over the country.